Fed up with the primitive and advanced-feature less Microsoft Calculator that comes built-in on Windows XP, 2003 and Vista operating system? Microsoft offers free software Calculator Plus that provides additional and advanced mathematical computing and calculation functions such as conversions between different measurement units for area, temperature, volume and more. It also includes all the mathematical functions offered in the original Microsoft Calculator prebuilt in Windows. Microsoft Calculator Plus provides conversion of units from area, consumption (engines), currencies, energy, length, power, pressure, temperature, velocity, volume, weights, with input and output of value possible in metric measurement unit, Imperial and U.S. customary units, natural measure units, non-standard units, and almost all units of currency including Euro, as you can easily create any new currency unit. 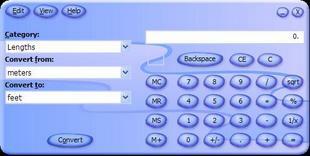 Microsoft Calculator Plus supports Windows XP, Windows 2003 and Windows Vista or later version.